Brazil's Bolsonaro in US to cement an alliance with Trump - SABC News - Breaking news, special reports, world, business, sport coverage of all South African current events. Africa's news leader. They touched down at Joint Base Andrews, on the outskirts of Washington. 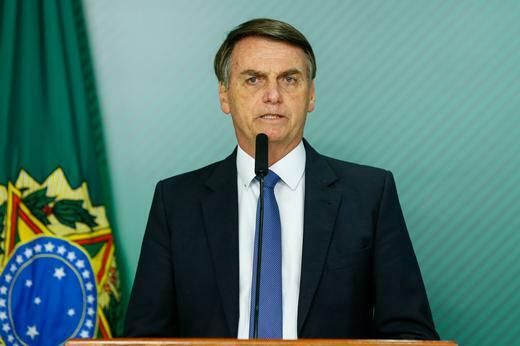 “It’s the first time in a long time that a Brazilian president who is not anti-American, comes to Washington,” Bolsonaro said on Twitter after he arrived. Outside the White House Sunday afternoon, dozens of demonstrators gathered to protest the visit — holding signs including one that accused Bolsonaro of being a “murderer” over apparent links to suspects in the killing of rights activist Marielle Franco. Police have said those ties are coincidental. Most pressing is the crisis in Venezuela, where the United States and Brazil and dozens of other countries have recognized opposition leader Juan Guaido as interim president with the goal of pushing President Nicolas Maduro from power. “Brazil and the United States together throw fear into defenders of backwardness and tyranny around the world,” Bolsonaro said on Twitter, which he is a prolific user of, like Trump. “Those who fear ties with a free and wealthy nation? That’s what we’ve come looking for,” Bolsonaro added. The 63-year-old former paratrooper shares Trump’s hostility to the “dictator” Maduro, who took over after the death of socialist leader Hugo Chavez in 2013. Trump has repeatedly insisted that “all options are on the table” with regards to Venezuela, a phrase understood to include military action. As well as a “private meeting” with Trump in the Oval Office on Tuesday, Bolsonaro will sit down with OAS Secretary General Luis Almagro, and participate in various forums to promote economic opportunities in Brazil. On Sunday night, Bolsonaro dined at the residence of Brazilian ambassador Sergio Amaral with “opinion makers” including, according to press reports, Bannon and US-based Brazilian writer Olavo de Carvalho, considered Bolsonaro’s ideological guru. Wall Street Journal columnist Walter Russell Mead, American Conservative Union president Matt Schlapp and Chris Buskirk, who edits the blog “American Greatness” were among others expected at the event. This entry was posted on 18 Mar 2019,06:16AM at 6:16 AM and is filed under World. You can follow any responses to this entry through the RSS 2.0 feed. Both comments and pings are currently closed.